Cynomolgus LILRB4, His Tag (CDK-C5227) is expressed from human 293 cells (HEK293). It contains AA Gln 22 - Glu 259 (Accession # XP_015297198.1). The protein has a calculated MW of 28.0 kDa. The protein migrates as 38 kDa under reducing (R) condition (SDS-PAGE) due to glycosylation. Cynomolgus LILRB4, His Tag on SDS-PAGE under reducing (R) condition. The gel was stained overnight with Coomassie Blue. The purity of the protein is greater than 90%. Leukocyte immunoglobulin-like receptor subfamily B member 4 (LILRB4) is also known as CD85 antigen-like family member K (CD85K), Immunoglobulin-like transcript 3 (ILT-3), Leukocyte immunoglobulin-like receptor 5 (LIR-5), Monocyte inhibitory receptor HM18, which belongs to the leukocyte immunoglobulin-like receptor (LIR) family. LILRB4 / CD85K contains 2 Ig-like C2-type (immunoglobulin-like) domains. 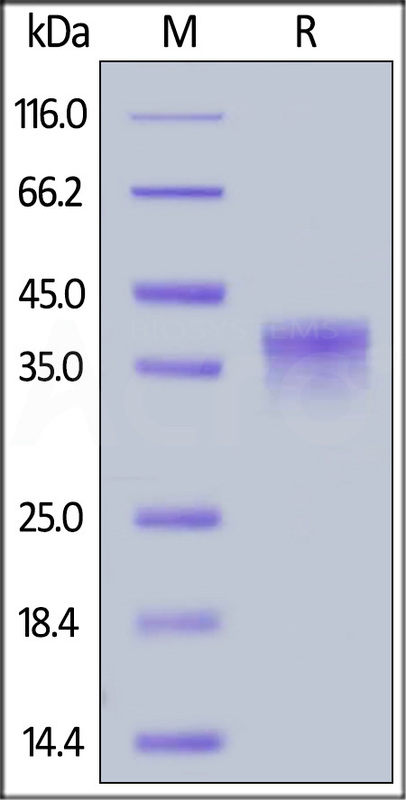 CD85K is detected in monocytes, macrophages, dendritic cells, lung, natural killer cells and B-cells. LILRB4 / CD85K is receptor for class I MHC antigens. CD85K recognizes a broad spectrum of HLA-A, HLA-B, HLA-C and HLA-G alleles, involved in the down-regulation of the immune response and the development of tolerance. LILRB4 interferes with TNFRSF5-signaling and NF-kappa-B up-regulation and inhibits receptor-mediated phosphorylation of cellular proteins and mobilization of intracellular calcium ions. (1) Cella M., et al., 1997, J. Exp. Med. 185:1743-1751. (2) Chang C.C., et al., 2002, Nat. Immunol. 3:237-243.